Ford Employees Call Louisville, Kentucky home! If you're one of the several thousand Ford employees planning to move to Louisville over the next six months be prepared for plenty of smiles, a great quality of life and a lower cost-of-living. I can tell you that from personal experience because 17 years ago my wife Norine and I also moved here from Atlanta. At the time I was a television anchor/reporter, I became a Louisville Realtor about eight years ago and haven't looked back. In the past few months our Medley Sokoler Team has been working with a number of Ford employees and their families were moving here. 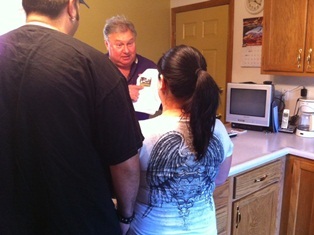 In fact, we just help one great family buy a brand-new home this past week. (See the video below). Some of my past Louisville Real Estate clients also include Ford employees who moved here five years ago from the Atlanta area. I just got off the phone with one of them talking about what Ford employees who are moving here from all parts of the country will find. I thought parts of the conversation might help ease fears for anybody moving here with families. Number one on the list is the ease of getting around Louisville. Up until a month ago traffic wasn't a serious concern, but then the Sherman Minton Bridge closed down and traffic between Kentucky and Indiana has become a nightmare! The good news is the bridge is expected to be repaired within six months. Still, we're finding a number of our clients deciding not to move to southern Indiana because of the problem. Bridge aside, it only takes about 20 minutes to get anywhere in Louisville. For those of us who have moved here from another location like Atlanta, where traffic can be a nightmare on a good day, that's one great feature of the city. For anyone with families and kids, the school systems in the Louisville area are good and we can say with some certainty getting better. Louisville has a new superintendent of schools, and there's a new drive to prove the quality of education. Louisville has a lot of things to do, from the Louisville Science Museum to the Kentucky Center for the performing arts, sports and dining out! The number of different types of restaurants is off-the-wall. Everything and then some with some real specialty restaurants as well. In my former life as a TV reporter and anchor in Louisville, I did dining out stories, so if you ever want a tip on where to go to eat pick up a phone call me. For example, if you like lobster, Louisville is actually the lobster capital of the central United States. Really! Because our airport is an international club for UPS, Clearwater Fine Foods import's Nova Scotia lobsters and then exports those lobsters to all parts of North America. The advantage for anyone living in Louisville is knowing that Clearwater sells wholesale to the public. Expect to pay $7.99 to $11.99 a pound for live lobster! If you ever get tired of Louisville your only an hour and a half or two from some other great cities to explore. Nashville, Tennessee, Cincinnati, Ohio and Indianapolis, Indiana, are all easy day trips. Heck, Chicago, Illinois and Memphis, Tennessee are only five hours away by car. Another advantage is the cost of living, for the most part utility bills are less, the price of a home is typically less than in other parts of the country, property taxes are less, and heating and cooling bills are less than up north. For those of you coming up from Atlanta, the heating and cooling bills may be a bit more but you'll find a trade-off with more distinct seasons. If you're one of the thousands of Ford employees coming to Louisville and haven't looked up with a Louisville realtor as of yet, please don't hesitate to give us a call. Would love to help you and your family find the right place to settle down and enjoy this great town we call Louisville! You can reach Bob Sokoler anytime - Day or Night at (502) 376-5483 or bob@bobsokoler.com.